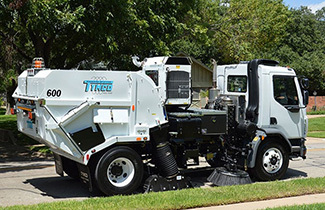 The TYMCO Model 600 is both extremely reliable and incredibly powerful. 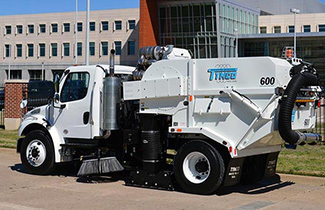 Whether you’re sweeping city streets during leaf season, cleaning up on a construction site or sweeping behind a milling machine or road reclaimer, getting the job done with the Model 600 is quick to perform and easy to operate. Model 600 hopper capacity is over 7.3 cubic yards and ensures owners a payload of over 10,000 lbs. 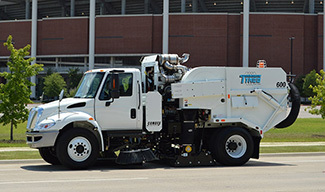 The TYMCO raker-assist dumping system provides smooth discharge of debris from a stationary hopper without requiring unnecessary telescopic hydraulic cylinders for hoisting, hydraulically controlled door latch assemblies, additional hydraulic door opening cylinders, grease points and safety concerns such as pinch points and overhead clearance. The 600 hopper comes standard with two easily accessible inspection doors located on both sides of the hopper. 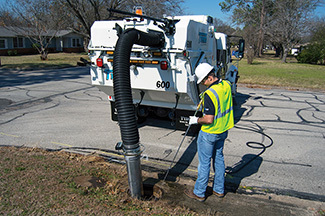 The Model 600 is the only street sweeper on the market with a high-efficiency centrifugal dust separator for maximum fine dust particulate separation which provides excellent dust control while using less water. The Model 600 has a water capacity of 440 gallons which provides hours of sweeping while maintaining excellent dust control. The 43” diameter Model 600 gutter brooms remove debris from curbs, gutters and around obstacles along city streets such as parked cars and maintenance equipment. The Model 600 is powered by a 124 horsepower John Deere auxiliary engine. This engine powers all hydraulic functions through a gear driven pump and directly belt drives the blower. 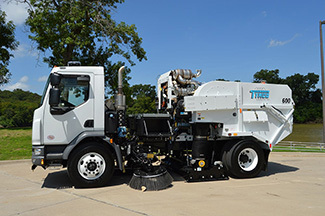 The lightweight aluminum alloy blower that drives the TYMCO Regenerative Air System only requires a modest amount of horsepower; therefore TYMCO’s engineers designed the Model 600 around a smaller, more fuel efficient auxiliary engine.